Mary Oliver, renowned poet has died at the age of 83. She was well known for her straight-talking poetry, believing that poetry ‘mustn’t be fancy”. This made me think of all the poetry I’ve read over the years…and yes, there have been poems I’ve skipped over – simply because I couldn’t understand a single word. I used to worry about readers feeling the same way about mine. That’s why I now try to include a preamble to my writes. That said, I’ve taken the idea of poetry not being ‘fancy’ and extrapolated it to naked words trying to escape my tongue, but ‘dressed’ only in truth. Always a pleasure to share great writing with followers! Today, I spent some time talking to a dear friend who wanted to write a poem but wasn’t sure if he should because, well… the truths it discusses might be too inflammatory. I told him, “If the words feel right, let them rip!” That’s what I do. That’s the only thing we can do (or, at least, just write them… and hold on to them until the right moment). I love your introduction. You see, I think that Mary’s ideas about what a poem should be if one wants said poem to be (easily) understood (by everyone) are exactly correct. I’m almost certain that I didn’t care for poetry in my youth because everything available to me at the time was… not a joy to read. Even when I understood what the poet said, I was annoyed by structure that I didn’t enjoy the reading. I think the best poetry walks into a heart naked. I love the last line of this. It was whilst I was writing that I realised the meaning of the saying ‘naked truth’. You recognise it immediately. Good advice you have your friend. He should read your blog – that’ll inspire him. One must always ‘let them out.’ Beautifully done. “Words clad only in the truth” are the very best kind. Wonderful! It’s always an act of daring to turn them loose. And like any act of daring, carries risk. Still, I feel certain that Zeus likes daring, and if Zeus likes it, there you have it. I read this out loud.. and guess who came bounding up the stairs…tail wagging? This is fantastic — one of your best pieces, I think. 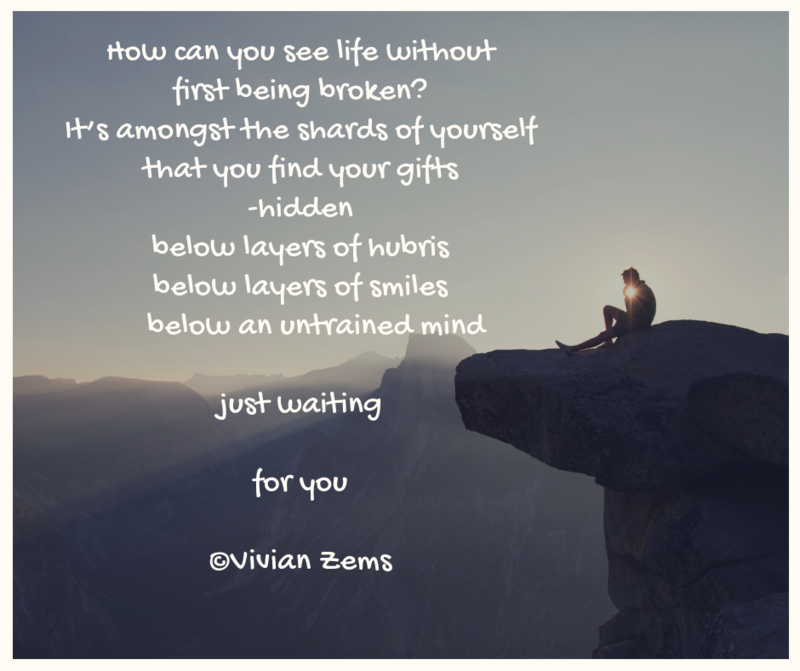 A powerful poem with words ‘clad only in the truth’, Viv! “….words / clad only in the truth”…That’s where lies a poet’s world. Great. I really like the honesty in this, the fear mixed with the desire to speak truth. It’s all out there, simple and beautiful. Thanks.. you really got it! Part! By all means part! Don’t let those lips quiver too long. Speak up! Speak out! Really glad you let them loose, Vivian. Glad you let them out. I think we are very lucky as poets to say exactly what we like and be proud of it to state how we feel about the world, ourselves and even of others. Somebody has got to let off steam! Oh, I love this. Poetry is a medium so rich in expression and freedom. I am reading Jessica Helen Lopez’s work and she is raw and honest.